LIBERAL, Kan. – The Seward County baseball team (15-13) were on the wrong end of a game that got out of hand quickly on Tuesday at Brent Gould Field, losing 22-11 to the Clarendon Bulldogs. Brooks Williams (1-1) started on the mound for the Saints, tossing just 1.2 innings before being pulled. He gave up seven runs off of four hits while walking three batters. Braeden Gould (1.0 IP), West Reddell (0.0 IP) and Blake Hale (4.1 IP) came in for relief but did not fare any better, giving up 15 runs off of 16 hits while walking three more batters. 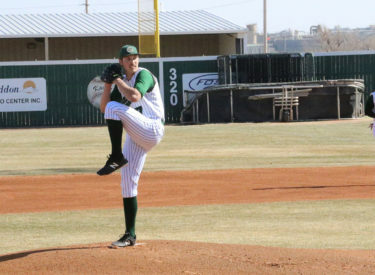 Seward finished with 11 hits on the day with Hunter Ratcliffe, Montana Newell and Jose Caraballo leading the way with two hits apiece. Dylan Paul hit a grand slam to lead the Saints with four RBI, while Caraballo finished with three RBI. The Bulldogs got things going with a three run first inning. A double and walk put runners in scoring position before a single drove in the first run. A sac fly with the next at-bat made it 2-0 before a third run scored from a passed ball. Clarendon wasted no time extending their lead in the bottom of the second, hitting a grand slam after Bulldogs reached base from a walk, double and hit-by-pitch to make it 7-0. The Bulldogs continued their onslaught in the bottom of the third, leading off with a double before another double and a home run made the game 10-0. Clarendon was nowhere near being done for the inning, scoring 11 more runs, all with two outs in the inning. A two RBI single pushed the lead to 12, followed by another single and double to push two more runs across the plate. A walk gave the Bulldogs two baserunners, but they quickly reached home with a three run home run to make it 17-0. A hit-by-pitch and walk put runners on first and second before a double scored the first run. Another double emptied the bases to make it 20-0 before a single brought home the final run of the inning to bring the game to 21-0. The Saints still couldn’t get on the board in the bottom of the third as three straight groundouts retired the side. A solo home run in the top of the fourth gave the Bulldogs a 22-point lead, but it would be the last run the scored in the game. Looking to avoid the worst loss in school history, the Saints needed to put something together. They got one run to score in the bottom of the fourth with a Ben Ayala single to shortstop. The Saints managed a big inning in the bottom of the seventh, but 11 runs still wasn’t enough to prevent the run-rule from occurring. The first run came across as Cole Bergdall had a four-pitch, bases loaded walk before Paul emptied the bases with a grand slam to right field to make it 22-6. Two walks and an error loaded the bases again for the Saints with Cruz Shope scoring one run with a line drive single to right field. Caraballo hit a bases clearing double to bring the score to 22-10 before Madsen doubled on a line drive to center field to bring the game and final tally to 22-11. Seward will get back to Jayhawk Conference play on Thursday at 1:00 p.m. for a doubleheader against the Cloud County Thunderbirds in Concordia.